There is a theme to many of the posts on this blog. Ryan will always find ways to maintain his routines, even when we change his surroundings. 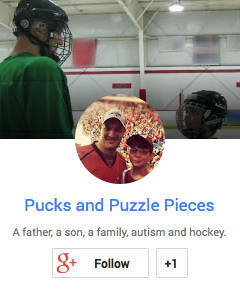 Monday’s post, in which Ryan found a way to watch NHL highlights while playing at the Winter Classic, reminded me of a similar situation on one of our other hockey trips. We were in Boston for a Saturday night game (a trip chronicled here) on the second half of a Philadelphia/Boston road trip. This game would come with a special treat. 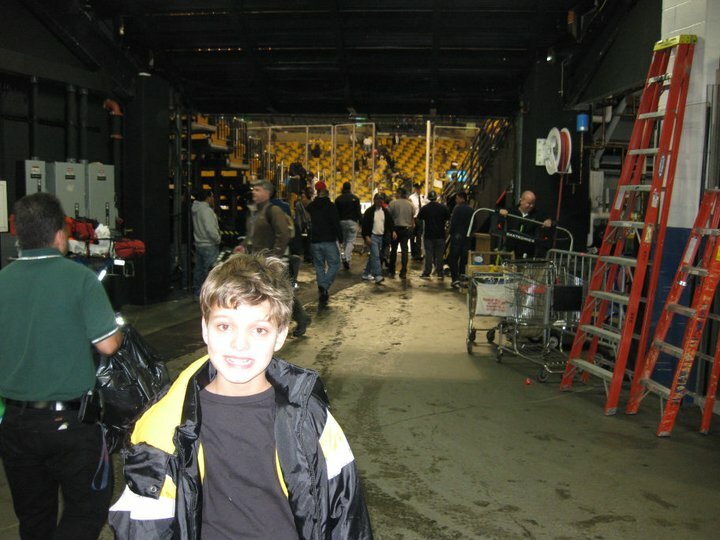 A friend with connections at TD Garden, the Bruins’ arena, had arranged for Ryan to get a post-game Zamboni ride. After saying goodbye to our seat-mates, Ryan and I made our way to the Zamboni entrance, found our contact, and watched the final minutes of what would turn out to be a shootout loss for the Bruins. 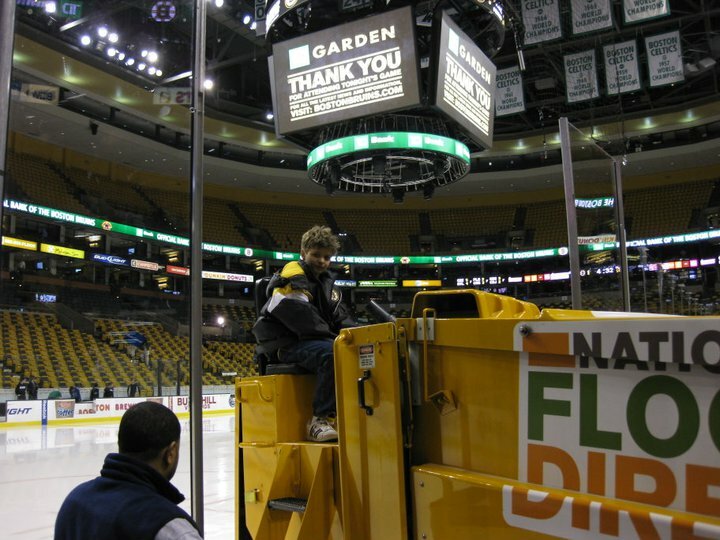 As soon as the players cleared the ice, Ryan climbed the Zamboni of his choice. I debated whether I should say something to the driver in case Ryan had any issues during the 10 minutes or so it takes to resurface the ice, but opted not to. I was pretty confident he’d be OK riding around in circles in a hockey arena. Plus, I’d be standing right by the glass, taking as many pictures as I could. 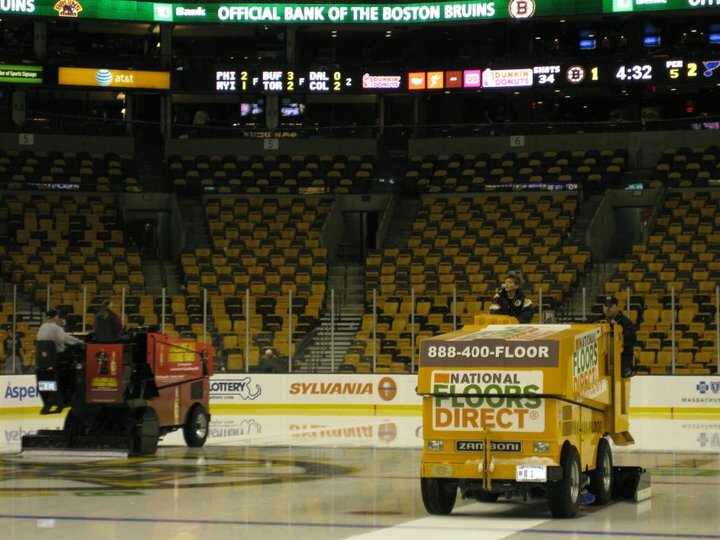 Getting ready for his post-game Zamboni ride in Boston. I watched like a proud papa as he beamed while riding around the now-empty arena. Just as I had at the Winter Classic, the more I watched, the more I noticed something. As he rode, Ryan was clearly look at something. He kept turning his head to pay attention to something in the arena, but I couldn’t tell what. There was more than one of whatever he was looking at, as he looked in different directions at either ends of the rink. As the ride completed, I snapped a few more pictures and yelled to Ryan as the Zamboni pulled off the rink. “What were you looking at out there?” I inquired. “I was checking the out of town scores!” he stated matter-of-factly. This is the kid that checks the NHL scores on his computer as soon as he gets up each morning. When we travel, he asks for my laptop, or my phone, or sees if the hotel has NHL Network, so he can find out who won last night. He has his favorite teams, but he pays attention to the entire league, and he loves the standings most of all. Any time we go to a game, he immediately locates the out-of-town scoreboard in the arena. His mind works like a computer, and he calculates the standings in his head as games end. So of course he spent his Zamboni ride watching the out-of-town scores. This wasn’t a distraction from the experience, it was additive, the same way being able to watch the NHL Network on the Citizens Bank Park scoreboard was additive. "I was checking the out-of-town scores!" Well, duh. Our kids often experience things differently from other children. They pay attention to smaller details, find ways to stick to routine in the midst of change, and take away different memories than other children might. It’s not always easy to watch, not when you take your kid to a birthday party and they ignore the main attraction to focus on some item of minutia that has captured their attention. Not when you take your kid to see the Harlem Globetrotters and they insist on watching a Flyers-Penguins game on TV instead. It’s true. Those moments can be few and far between. Our kids figure out how to reorder the world to suit themselves every single day. I can’t believe I am the first to post a comment. It is painful to watch the desperate need for routine and order in Ryan’s life. At times I can fell the waves of emotions roll off him when he is struggling. Sometimes it is everything I can do not to just scoop him up and cradle him away from the world. But that would cause it’s own set of issues. At least he is affectionate and loving to allow my personal need to touch and tease. Mary, you clearly understand him better than most. Thanks for that comment, and for your continued efforts to connect with him.